The Epstein Barr Virus (EBV) can cause “autoimmune diseases (e.g. multiple sclerosis and rheumatoid arthritis (RA),” according to a study published in Immune Network in February 2014. (1) The CBCD reviews the study and recommends Novirin or Gene-Eden-VIR against the latent EBV. Click to learn more about the Epstein Barr Virus. The Center for the Biology of Chronic Disease (CBCD) therefore recommends that individuals infected with EBV take Novirin or Gene-Eden-VIR. The formula of these natural antiviral products was tested by Hanan Polansky and Edan Itzkovitz from the CBCD in two clinical studies that followed FDA guidelines. 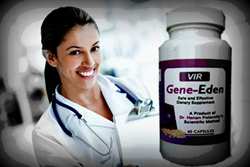 The studies showed that the Gene-Eden-VIR and Novirin formula is effective against EBV and other viruses. The clinical studies were published in the peer reviewed, medical journal Pharmacology & Pharmacy, the first, in a special edition on Advances in Antiviral Drugs. Study authors wrote that, “individuals infected with EBV…reported a safe decrease in their symptoms following treatment with Gene-Eden-VIR.” (3) The study authors also wrote that, “We observed a statistically significant decrease in the severity, duration, and frequency of symptoms.” (3) In addition, this natural antiviral was recently proven to reduce mental and physical fatigue in a post-marketing clinical study that followed FDA guidelines. “Alterations of the immune system can lead to acute forms of arthritis, which can be followed by chronic arthralgia or arthritis.” (See Medscape.com, from August 31, 2012) (4) Arthritis can be a crippling disease. It progressively destroys synovial joints (the most common type of joint in the human body) and can also cause other complications. Women suffer from arthritis more than men. In addition, it has “enormous personal, social, and economic impact; women with RA have overall mortality rates 2.3-fold those in age-matched controls. New biologic therapies, based on an increasing understanding of the molecular mechanisms involved in RA, afford a more normal life to many, but the burden of disease remains high. At present there is no known cure (2).” That is, women who suffer from arthritis have a much higher chance of dying from the disease. Are there any drugs or remedies that can reduce EBV symptoms? “A few antiviral drugs are available that were shown to inhibit EBV replication in cell culture. These drugs include the acyclic nucleoside analogues aciclovir, ganciclovir, penciclovir, and their respective prodrugs valaciclovir, valganciclovir and famciclovir, the acyclic nucleotide analogues cidofovir and adefovir, and the pyrophosphate analogue foscarnet. However, clinical studies have shown that these drugs are mostly ineffective in humans.” (See Pharmacology & Pharmacy, from September 2013) (3). In contrast, there are two natural antiviral products with a formula that was shown to reduce EBV symptoms in two post-marketing clinical studies. Because arthritis patients have “a 10-fold increase in EBV DNA load in peripheral blood mononuclear cells compared with that in controls (2),” The CBCD recommends that individuals with the condition ask their doctors for an EBV blood test. If positive, they should take Novirin or Gene-Eden-VIR. Novirin shares the same formula as Gene-Eden-VIR. The difference between the two is that Novirin has higher quality, more expensive ingredients. The Novirin/Gene-Eden-VIR formula was tested in two post-marketing clinical studies published in September 2013 and March 2014, respectively, in the peer reviewed medical journal Pharmacy & Pharmacology (3). To learn more about Novirin, visit http://www.novirin.com and about Gene-Eden-VIR, visit http://www.gene-eden-vir.com. (1) Fujiwara S. Reproduction of epstein-barr virus infection and pathogenesis in humanized mice. Immune Netw. 2014 Feb;14(1):1-6. (2) Epstein–Barr virus and rheumatoid arthritis: is there a link? Published in 2006. (4) Khouqeer, R. Viral Arthritis - Medscape.com. Updated on August 31, 2012.